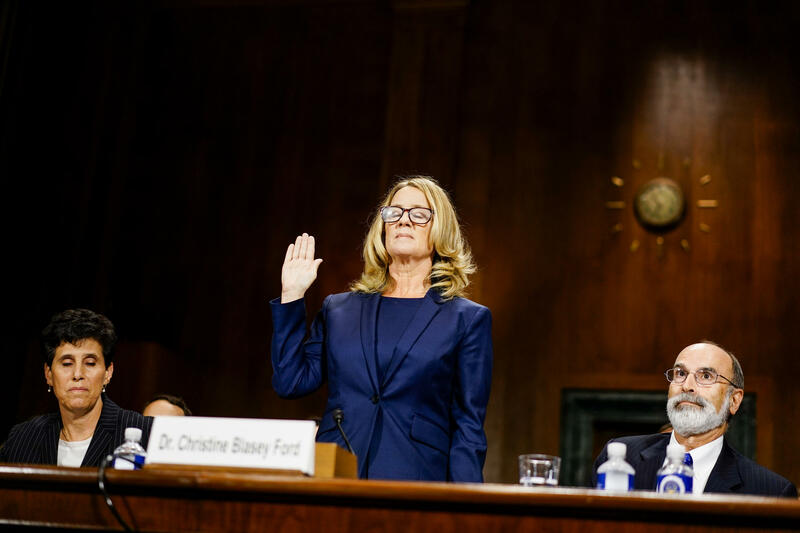 Kavanaugh accuser Christine Blasey Ford is sworn in before testifying Thursday at a confirmation hearing for the Supreme Court nominee. After a day of wrenching testimony from Supreme Court nominee Brett Kavanaugh and Christine Blasey Ford — who has accused him of sexual assault in high school — more Americans say they believe Ford's account over Kavanaugh's denials, according to an NPR/PBS NewsHour/Marist poll released Wednesday. In choosing who is telling the truth, 45 percent said Ford is, up from 32 percent ahead of her Sept. 27 testimony. A third (33 percent) said Kavanaugh is the one telling the truth, up slightly from 26 percent before he testified but not as much of a rise as for Ford. The daylong hearing appears to have been influential in helping people decide who was telling the truth. Before the hearing, 42 percent said they were unsure whom to believe. Now, just 22 percent are unsure. The results represent a shift from 1991, when more people said they believed then-Supreme Court nominee Clarence Thomas over Anita Hill. Hill accused Thomas of sexual harassment in the workplace. A 1991 CBS/New York Times poll, also conducted days after their dramatic, televised Capitol Hill testimonies, found that 58 percent believed Thomas more, as opposed to just 24 percent who said Hill. "If it remains 'he said, she said,' the benefit of the doubt is very different than 1991, and it goes to Ford not Kavanaugh," said Lee Miringoff, director of the Marist Institute for Public Opinion, which conducted the poll. "It shows the reaction to the testimony and does show an underlying change in attitude than 27 years ago." Yet Republicans are pushing forward with Kavanaugh's nomination, seeing enthusiasm among the GOP base rising dramatically in the midst of the Kavanaugh controversy. Even President Trump, after days of calling Ford "credible," changed his tune and mocked Ford at her during a rally in Mississippi on Tuesday night, a day after the poll was conducted. "Thirty-six years ago, this happened," Trump said. " 'I had one beer.' Right? 'I had one beer.' How did you get home? 'I don't remember.' How'd you get there? 'I don't remember.' Where is the place? 'I don't remember.' How many years ago was it? 'I don't know. I don't know. I don't know. I don't know.' What neighborhood was it in? 'I don't know.' Where's the house? 'I don't know.' Upstairs, downstairs, where was it? 'I don't know. But I had one beer. That's the only thing I remember.' "
The crowd applauded wildly, as the president's ridicule grew. Ford, in her testimony, offered more detail than the president noted. With just over a month to go until the consequential midterm elections across the country that will determine who controls Congress, Republicans are gambling that several of the key groups leaning toward Democrats — young people, Latinos and independents — won't show up in big numbers at the polls. But those who said November's elections are "very important" oppose Kavanaugh's nomination 51 percent to 44 percent. Americans are hotly divided by party on whom to believe. Yes, there is a big gender gap. Men are split on whom they believe: 39 percent say Kavanaugh, 37 percent say Ford. Women, on the other hand, are far more on Ford's side: 52 percent believe her, 27 percent say Kavanaugh. But that gap disappears when looking at it by party – 80 percent of Democratic men believe Ford as do 74 percent of Democratic women. Among Republicans, 77 percent of men believe Kavanaugh, as do 73 percent of women. Where there is a difference by gender is among independents. Independent men are split 39 percent to 35 percent, siding slightly more with Ford, while a solid majority of women believe Ford, 56 percent to 24 percent. "Partisanship is really the driving force," Miringoff noted, pointing out that partisanship is the "most dominant" force "in dividing public opinion." That would make sense considering how partisan a performance Kavanaugh turned in during his testimony, deriding Democrats' conduct as an "embarrassment" and dismissing the movement against him as "revenge on behalf of the Clintons." That was enough to rally Republicans and Trump to his side, but not the public overall. Nearly half of Americans say they oppose Kavanaugh's nomination — 48 percent compared with 41 percent who support it. Before his testimony, 43 percent opposed his nomination and 38 percent supported it. Overall, by a 40 percent to 31 percent margin, more voters say they are likely to vote for a candidate in these midterm elections who opposes Kavanaugh. About a quarter of voters said it makes no difference to their vote. The FBI is conducting a supplemental investigation into the allegations against Kavanaugh that is expected to be wrapped up by the end of the week. If there is still a doubt about whether the allegations against Kavanaugh are true after the investigation is complete, Americans say he should not be confirmed to the Supreme Court by a 52 percent to 40 percent margin. That is also a big difference from 1991. Back then, the same CBS/New York Times poll found that 56 percent thought Thomas should be confirmed, even if doubt still existed. But one group does still think he should be confirmed if doubt exists: 77 percent of Republicans say so, which helps explain the bitter battle being waged to confirm Kavanaugh. The NPR/PBS NewsHour/Marist poll was conducted Monday and is based on interviews with 1,183 adults, including 996 registered voters. Among questions of adults, there is a margin of error of 3.8 percentage points; for registered voters, it is 4.2 percentage points.